New Delhi: Alag Natarajan, a man in his late 60s, is living up to his name. (Alag means ‘different’ in Hindi). His day begins at 4.30am. 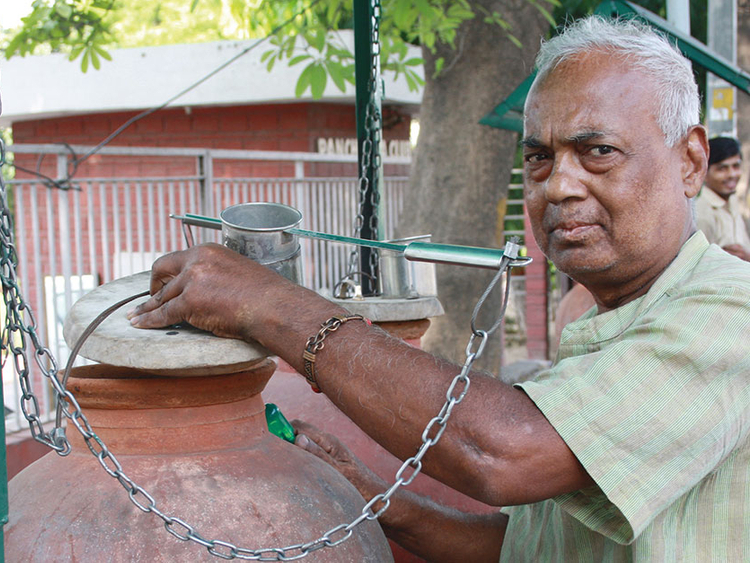 But, unlike most people his age, who head for a morning walk, Natarajan spends an hour-and-a-half filling more than 60 matkas (clay pots) that he has placed in several South Delhi colonies to quench the thirst of hundreds of people in the city’s soaring temperatures. Sensing that it was not enough, Natarajan decided to expand the idea to neighbouring colonies including Green Park, Hauz Khas and Chirag Delhi. But that not only required installing more matka stands, but also the paraphernalia to fill them. Natarajan, an engineer by profession, was set on a mission. He modified his van and placed a huge plastic water tank inside it. With the help of a pump and a generator he filled the tanks. The van was then driven around filling all the pots with fresh drinking water at 15 locations. As Natarajan’s silent revolution began, it inspired others and people came forward to help. “Earlier, I started filling the tank with water from my own house. But during the summer months, the requirement was more and the pots needed around 2,000 litres of water daily. “Luckily, authorities from a nearby school and two households offered support by allowing me to draw water from their premises. It has taken me three years to keep modifying the van and I had to import some equipment from the United States,” he said. Though all activity is carried out and maintained primarily through the van, it is not always possible for Natarajan to do up four to five rounds of the colonies to ensure the matkas are always filled. For this, he has volunteers to help him. “My household help and his wife are my support pillars. While the man doubles up as a driver and caretaker of the van, his wife keeps a check and ensures the matkas are filled with water all day round. That apart, our gardener also assists with much of the work,” he adds. The city’s roads are hard on bicycles. So, Natarajan has placed 100 cycle pumps at all the 15 matka stands and other stand-alone strategic locations. This gives poor people the flexibility to fill air at any time of the day and night. He also installs bells for cyclists who cannot afford to spend Rs50 to Rs70 (Dh2.85 to Dh4) to buy one. “A number of cyclists and pedestrians die on Delhi roads. I am not saying it will help in saving their lives, but it can at least give them some chance,” he felt. Along with his team, Natarajan visits a few designated points, such as the Panchsheel Club, where he stops cyclists, labourers and the poor for refreshments. They are offered lassi [butter milk] and seasonal fruit and vegetables including cucumber, watermelon and radish. “I am neither backed by an NGO, nor am I a government-sponsored organisation. All this work is self-funded through my pension and life savings. I do get a few donations and lot of family support,” he says. Natarajan’s philanthropic journey began few years ago. He started by offering food to the homeless in Chandni Chowk area and carrying out the cremation of destitute and giving them a dignified end. Having grown up in Bengaluru, he left home as a young adult for London to visit his sister on a tourist visa, and ended up staying there for 40 years. Ten years ago, he was diagnosed with colon cancer. That changed his life and mindset. Undergoing treatment and becoming cancer-free, Natarajan settled in Delhi and decided to dedicate his post-retirement years in the service of the needy. “I guess that has helped me overcome the fear of death,” he theorised. Alag Natarajan plans to imprint his personal telephone number on all the matka stands, so that people can notify him when a pot containing fresh drinking water is empty and also, if someone offers to provide any kind of support to maintain the stands.